After having stabilised in the last few months, uranium for immediate delivery rose $ 5 to $ 29 per pound the two weeks to May 11, the biggest two-week gain since January 1996. This is the highest price since 1981. The further price increase is on expectations reactors being built in China, India and Russia will drain inventories. China recently announced that it plans to build 40 nuclear reactors within the next 15 years to increase propartion of its electricity generated by nuclear power from the current 2,4% to 4% in 15 years time. In the 1940s, the US government began buying large amounts of uranium in the effort to produce the world’s first atomic bomb. After World War II, the Atomic Energy Commission began examining peaceful uses. The first privately funded nuclear energy plant came online in Illinois in 1959. By the 1970s, about 250 nuclear reactors were planned across the United States – but then an accident in Pennsylvania changed all that. Three Mile Island hit, and starting in the 1980s utilities started cancelling plants. The investing public, the lay public, everyone kind of turned on nuclear power at that time. The uranium market collapsed on all those cancelled plants. A second blow came when the Soviet Union fell apart, and enriched uranium removed from Russian bombs was blended down to reactor-grade fuel and dumped on the market. The third jolt occurred when the Clinton-administration privatised a government-owned uranium-enrichment program, and 70 million pounds of “yellowcake” was unloaded on the market. Exploration also tapered off. Wyoming once had eight uranium operations, producing 12 million pounds per year. Now it has none. In the post-World War-II area, global uranium production exceeded annual consumption, for all uses, until late in the 1980s. However, beginning around 1989-1990 worldwide consumption of uranium exceeded annual production. That differential became substantial throughout the 1990s and into the first half of this decade. The shortfall has been made up through secondary sources such as excess inventories, the dismantling and recycling of nuclear weapons and used reactor fuel that has been reprocessed. Concerns over shortage of oil and gas with resulting high prices in these fossil fuels, along with environmental issues regarding greenhouse gas emissions, has fuelled a new interest in nuclear energy as the source of power to meet current and future global demand for electricity. Nuclear energy offers a clean and efficient alternative to energy produced from coal, oil or natural gas. Electricity is produced at lower costs and a nuclear generating plant does not produce carbon dioxide emissions. New supplies of uranium will come at a higher cost which, in turn, will continue to put upward pressure on the price of uranium. Nuclear power provides about 16% of the world’s total annual electricity generation. France receives 78% of its electricity from nuclear, Belgium almost 56%, Sweden close to 50%, South Korea 40%, Switzerland 40%, Japan 25% and the United States 20%. 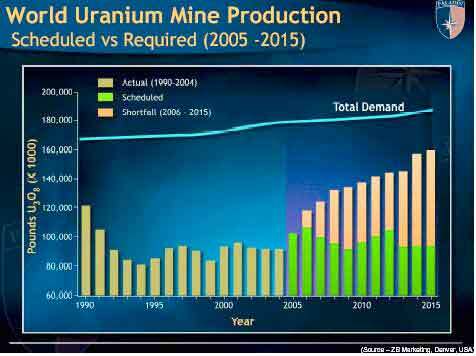 Projected worldwide annual uranium needs will expend in accordance with the installed nuclear capacity. According to Dustin J. Garrow, President of International Nuclear Inc. current global uranium requirements approximate 173.3 million pounds U3O8 and will increase to 185.2 million pounds by 2010, reaching 202.5 pounds in 2020. The growing uranium needs were met by the utilisation of so-called “secondary uranium supplies” which reflected a draw down of stockpiles developed in the pre-1990 timeframe. Since the late-1980s, the global uranium market was dominated by secondary uranium supplies especially as the Republics of the Former Soviet Union (FSU), particularly the Russian Federation, aggressively pursued uranium sales as one avenue to raise hard currency following the dissolution of the USSR. The international non-proliferation program involving the down-blending of Russian weapons grade uranium into commercial grade fuel being consumed in the United States, the “Megatons-to-Megawatts” Program had a huge impact on uranium prices in the latter half of the 1990s. Agreements were concluded in the 1992-1994 timeframe involving 500 metric tons of Russian Highly Enriched Uranium (average enrichment level at or above 90% U235), which was to be down-blended in the Russian Federation and the resultant commercial-grade fuel (average enrichment 4.5-5.0% U235) shipped into the United States. This program involves an estimated 360-400 million pounds U3O8 that is sold into the US market under strict limitations (Europe/Asia Pacific) or shipped back to the Russian Federation. Since the program began in 1995, shipments of HEU-derived nuclear fuel have contained about 158 pounds U3O8. The current US-Russian HEU Program extends through 2013. Looking forward, three western companies: Cameco Corporation, AREVA/COGEMA and, RWE NUKEM are committed to purchase a substantial portion of the uranium to be returned to the US. Other reserves included substantial uranium incentives held by the US government, which were transferred to the U.S. Enrichment Corporation (USEC) upon its privatisation in 1998. Much of that uranium, totalling about 74 million pounds U3O8, found its way into the market place, either spot or term, with resultant price declines. Uranium reserves currently held by the U.S. Department of Energy (USDOE) are another potential source of uranium to the market place. A recent source of uranium that USDOE’s uranium stockpile totals almost 75 million pounds U3O8-various forms. A large portion of the government inventory (52.6 million pounds U3O8 equivalent or 70%) must be held in a Monitored Stockpile until 2009 under terms of the US-Russian HEU Program and another 7.6 million pounds U3O8 (10%) is in the form of HEU which would not meet technical specifications for commercial-grade fuel and requires extensive processing. For more than a decade, world-wide annual uranium production has remained below 100 pounds U3O8, for short of the actual consumption which is approximately 170 million pounds U3O8 by the 435 reactors in the world. International Nuclear anticipates that total global uranium production will have broken the 100 million pounds barrier in 2004. 35 more reactors are under construction in China, Taiwan, India, Brazil and Eastern Europe, which will further increase demand. World uranium production in 2003 totalled 92.4 million pounds U3O8 with Canada and Australia producing more than 50% of that aggregate output. The next largest countries in terms of uranium production were the Russian Federation, Niger and Kazakhstan. International Nuclear’s most recent “Scheduled Uranium Production Forecast´ shows world-wide uranium production increasing from current levels (around 100 million pounds U3O8) up to as much as 115 million pounds U3O8 per year by 2010-2011, before declining as some mines reach reserve depletion. Global uranium consumption is 160 million to 180 million pounds by the 435 reactors in the world. 35 more reactors are under construction in China, Taiwan, India Brazil and Eastern Europe, which will further increase demand. America’s 103 reactors are housed in 66 plants that have cranked out more than 700 billion kilowatt hours for five straight years, but American uranium production peaked in 1980 at 43.7 million pounds, according to the US Energy Information Administration. By 1980, US production had dropped to 8.9 million pounds. In 2003, it was only about 2 million pounds, most coming from the Smith Ranch-Highland mine, north of Douglas, Wyoming, and Cameco’s other active mine, the Crow Butte operation near Crawford, Nebraska. Canada-based Cameco is the world’s largest, low cost uranium producer with four operating mines in Canada and the US. The Company provides almost 20% of the world’s uranium demand. Cameco was created in 1988 by the merger of two Crown corporations – Saskatchewan Mining Development Corp. and Eldorado Nuclear Ltd. In 1991, the Company completed its initial public offering and shares began trading on the Toronto and Montreal Stock Exchanges, followed by trading on the New York Stock Exchange in 1996. In 1996, Cameco purchased Power Resources, Inc., the largest uranium producer in the United States, increasing its reserves and resources by 10%. Also in 1996, Cameco Gold was formed as a subsidiary of Cameco to conduct the Company’s gold business. In 1997, the Kumtor gold operation in Kyrgyzstan, Central Asia, owned one-third by Cameco, achieved commercial production. In 1998, Cameco acquired Canada-based Uranerz Exploration and Mining Ltd. and Uranerz U.S.A. Inc, increasing its levels by about 30%. In 1999, Cameco sold a 14% interest in McArthur River, and 17% in and 17% in Key Lake to Cogema Resources. The McArthur River Mine, the world’s largest high-grade uranium mine, located in the Athabasca Basin of northwestern Saskatchewan, Canada, achieved commercial production in November 2000 and became the world’s largest high-grade uranium deposit. In 2001, the McArthur River/Key Lake uranium operations achieved full production of 18 million pounds. Proven and probable reserves are 437 million pounds of U3O8. The average ore grade is 25% U3O8 and is valued at US$ 10,000 per ton, a gold equivalent of $ 25 oz/ton. Cameco is controlling ownership of the world’s largest high-grade reserves and low-cost operations in northern Saskatchewan, with ore graded 100 times the world average. The Company has a total of 550 million pounds of proven and probable reserves. Two new mines are being developed in Canada and Central Asia. Just recently, Cameco announced that the Cigar Lake joint venture has decided to proceed immediately with construction at the Cigar Lake project, located about 660 kilometres north of Saskatoon, and discovered in 1981. Cigar Lake is the world’s second largest high-grade uranium deposit after McArthur River. Cameco operates Cigar Lake on behalf of a joint venture consisting of Cameco (slightly larger than 50%), Cogema Resources, a subsidiary of Areva (37%), Idemitsu Uran Exploration Canada (8%) and Tepco Resources (5%). On December 20, 2004, Canadian Nuclear Safety Commission (CNSC) announced that it had approved a construction licence for Cigar Lake. Cameco anticipates construction will begin early 2005 and take approximately 27 months to complete. Production could begin in 2007, followed by a ramp-up period of up to 3 years before the mine reaches full production of 18 million pounds per year. In making the development decision, the Cigar Lake joint venture approved a construction budget of about $ 450 million (Cameco’s share is $ 225 million) that includes surface and underground facilities, as well as change to the mining facilities at McClear Lake and Robbitt Lake. Cameco expects to fund its share of construction costs with operational cash flow and debt. Denison Mines is one of only two Canadian publicly traded companies that are primary involved in the uranium mining and production business. In the last five years, Denison’s uranium business, now centred in Saskatchewan, has evolved from development, to start-up, to a 22.5% interest in the McLean Lake Uranium production facility, that is one of the five largest in the world. Denison Mines also has a 25.17% interest in the Midwest uranium project located in northern Saskatchewan, after recently having acquired a further 5.21% interest from Redstone Resources Inc., a subsidiary of Newmont Mining Corporation. The consideration for the acquisition of the interest is Cdn$ 3.78 million payable by the issuance of 320,625 treasury shares, valued at Cdn$ 7.85 per share, and the payment of Cdn$ 1.26 million in cash. The acquisition added 1.75 million pounds to the Company’s uranium reserve base, bringing total reserves to over 13.5 million pounds. An expanded exploration program is being planned for the Midwest property, which will focus on three areas under the Midwest deposit to further evaluate the known basement mineralisation, north of the deposit to follow- up on a hole drilled in the 1980s grading 8.24% U3O8 over 3.8 metres and testing of a relatively untested conductor south of the Midwest deposit. was formed to take advantage of a perceived uranium market production supply shortfall in the mid-1990s. IUC purchased in 1997 all of the uranium assets of a bankrupt company called Energy Fuels – the assets included a permitted, operating uranium mill and tailings system, several uranium/vanadium mines in the US, as well as a large uranium deposit in Mongolia. The purchase price was approximately US$ 21 million. There are only two operating uranium mills in the US and ICU’s White Mesa Mill is one of them. The mill is fully permitted and is a large capacity, dual-circuit 2,000 tons per day mill. It is estimated that it would cost a minimum of US$ 100 million to construct the mill today, if even possible to construct given the onerous permitting process. Total tailings capacity is about 10 million tons, of which over 6 million tons is remaining. During the prior years of lower uranium prices, IUC put its producing mines on standby and initiated the business of recycling uranium-bearing materials, called “alternate feeds”. To date, the mill has recovered over 1.1 million pounds of uranium from these alternate feeds and generated over $ 38 million from processing fees. The mill is scheduled to begin processing in early 2005 some recently stockpiled material that will generate over 400,000 pounds of uranium for the Company. In Canada, IUC has assembled a strategic land package in the Athabasca Basin totalling over 350,000 hectares. The Company holds 100% staked land, option agreements with Phelps Dodge and option agreements with JNR Resources. IUC is scheduling exploration programs on several of its properties. The current focus is on the Moore Lake project under option from JNR Resources, whereby IUC can earn a 75% interest. U.S. Energy Corp In the United States, U.S. Energy Corp and its majority owned subsidiary Crested Corp. are engaged in joint business operations as USECC. Through their subsidiary Rocky Mountain Gas, Inc. they own interests in over 403,000 gross acres prospective for coalbed methane (CBM) in the Powder River Basin of Wyoming and Montana and acreage adjacent to the Greater Green River Basin in southwest Wyoming. In November 2004, U.S. Energy Corp. (“USE”) and Crested Corp. announced signing a binding letter agreement with Vancouver-based Bell Coast Capital Corp., with respect to the Sheep Mountain uranium mines and properties held by USE and Crested, located in the Crooks Cap Mining District in south central Fremont County. The Sheep Mountain mines reportedly have over 20 million pounds of contained uranium. Bell Coast can earn a 50% interest in the Sheep Mountain uranium mines and properties by making payments up to $ 4.05 million and 4 million common shares of Bell Coast. (formerly Clan Resources) has signed agreements with two separate vendors to acquire 56 uranium properties in the States of Wyoming and Arizona. Many of these properties have seen extensive drilling by previous operators. These acquisitions establish the Company’s strategic position as a significant property holder in the State of Arizona, as well as providing key property positions in all of the three principal uranium districts of the State of Wyoming. These include 2 state leases in the Powder River Basin area, 4 properties in the Shirley Basin area, 6 state leases and 7 properties in the Red Desert or Great Divide district. Coupled with the Company’s earlier acquisitions in Utah and Oregon, Energy Metals has established itself as one of the largest holders of uranium properties in the United States. owns a 10% interest in a Limited Partnership that holds a 3% Net Smelter Royalty n the world-class Voisey Bay’s nickelcopper- cobalt project in Labrador, Canada. Altius, together with 50% partner Fronteer Development, controls the 780 km² Central Mineral Belt-property in Labrador, what is historically regarded as Canada’s second most important uranium district. The eastern part of the belt is an uranium-rich example of an iron-oxide-copper-gold (IOCG) district with potential for large tonnage, breccia-style uranium deposits. has been developing its uranium properties in Nunavut Territory since 1996. The Coppermine River area covers 120,900 hectares. In the 1970s companies such as Esso Minerals, BP Minerals and Uranerz were all active in the Hornby Bay basin. In 1972, Esso discovered the subeconomic Mountain Lake deposit. By the late 1970s, BP Minerals had consolidated virtually all the area. HBE now controls the eastern area of the basin and owns all of the BP Minerals data. The Asiak River area covers 89,700 hectares. Australia is the world’s largest source of uranium with 28% of global known recoverable resources within its borders, ahead of Kazakhstan with 16% and Canada with 12%. It supplies 25% of the world’s uranium, mainly to the US, Japan and South Korea. However, in Queensland, Labour government’s historically restrictive policies on developing uranium mining have sidelined two huge uranium deposits at the Valhalla and Skal sites which together comprise Australia’s fifth-largest uranium resource owned 50% each by joint venture partners Resolute Mining and Summit Resources. This policy may change in the not too distant future due to the awareness that Global Warming needs to be arrested, and that nuclear power could play an important role. mine in South Australia is not only the world’s largest uranium mineral resource but also the world’s lowest-cost producer. Total mineral resources are estimated to be 3.8 billion tonnes at a copper-equivalent grade of 2.2% (using the following commodity prices: copper A$ 1.42 l/b; uranium U3O8 A$ 130 l/b, gold A$ 500/oz, silver A$ 8.33/oz). Copper contained in the resource is estimated at 42.6 million tonnes, uranium at 4.1 million tonnes and total contained ounces of gold at 55.1 million. Based on these estimates, Olympic Dam contains the world’s 4th largest remaining copper and gold resources, and contains 38% of the total global uranium resource base. WMC is currently spending A$ 50 million studying expansion plans for Olympic Dam’s output up to 15,000 tonnes of uranium oxide and 500,000 tonnes of copper annually. This could make the mine the world’s largest producing and lowest cost uranium mine by 2010. As a by-product of copper production, WMC’s marginal cost of producing uranium at Olympic Dam is less than US$ 3/lb. WMC expects to have produced 4,300 tonnes of uranium for export from Olympic Dam in 2004. The Company’s uranium is exported to electricity generators in Asia, Europe and North America under bilateral agreements between Australia and host governments. In October 2004, Swiss-based and London-listed Xstrata made a A$ 7.4 billion hostile offer to WMC at a price of A$ 6.35 per share, representing a premium of 29.1% to the market price of A$ 4.92 per share and a premium of 43.3% or A$ 2.2 billion to the estimates of net present value of approximately A$ 4.43 per share. With the market speculating on a higher counter-bid, Xstrata revised its offer to A$ 7.00 per share which was due to close at March 24, 2005. However, on March 8, 2005, BHP Billiton topped Xstrata’s bid with a friendly all-cash offer of A$ 7.85 per share valuing WMC at A$ 9.2 billion (US$ 7.3 billion). owns significant uranium deposits in the Klerksdorp area in the form of the Dominion Reefs, Rietkuil and Rhenosterhoek resources. These resources were previously mined by subsidiaries of Anglo- American, including 2.5 million pounds U3O8 at a grade of 0.09% from the Dominion Mine between 1955 and 1961. The deposits are uranium-rich, but also carry important gold credits. Aflease aims to commence production in Q1 2007 at a rate of 0.9 million pounds U3O8 per annum rising to 4.1 million pounds U3O8 and 96,000 ounces gold by 2013. The life mine average cash operating cost is estimated to be US$ 14/lb U3O8 (net of gold credits). In February 2005, Aflease entered into an agreement in principle with Harmony Gold Mining, whereby Aflease would acquire the right to mine, process and market all of Harmony’s uranium in South Africa. These rights have been acquired for R 200 million and payment to Harmony would be by way of Aflease scrip. In addition, Harmony will receive a royalty as and when the estimated resources of 155 million pounds U308 of high grade dump and tailings material are bought to account. By acquiring Harmony’s uranium interests, Aflease will have a uranium resource of more than 600 million pounds, which firmly places the Company among the top 10 international exploration companies. Langer Heinrich Uranium Project, located in the west of Central Namibia, Southern Africa, was discovered in 1973, mainly by Gencor (the original explorer), a large South African mining house that evolved into BHPBilliton. In August 2002, Paladin Resources, an Australian publicly listed company, acquired 100% of Langer Heinrich Uranium (Pty) Ltd., the Namibian company holding the Project rights and completed a Pre-Feasibility study at a cost of US$ 1.26 million. This study strongly justified taking the Project to the US$ 3.0 million Bankable Feasibility Study (BFS) that commenced in 2004 and will be completed by April 2005. Langer Heinrich will be an open pit mining operation. The orebody occurs from surface to a depth of about 50 metres in a series of labular lenses. The capital estimate for the Project is now estimated to be US$ 80 million. Measured and indicated resources are 24.2 million tonnes @ 0.07% U308 – 17,200 tonnes U308. Using updated model from the near finalised BFS and a conservative long term sales contract price of $ 25/lb U308 with an annual production of 2.52 million pounds U308 over 15 years the project is very robust generating an NPV (10%) of US$ 148 million with an IRR of 30% (before tax and finance). Production start up is envisaged for 2008.
focused on the Saddle Hills Uranium Project, is an advanced-stage uranium exploration company in Mongolia. Situated in a region of established infrastructure, the 1,900 square kilometre Saddle Hills Uranium Project is unique in that one of its uranium deposits, the Gurvanbulag, was previously readied for production. The Gurvanbulag deposit, with a reported historic resource of 41.7 million pounds U308 (not N/43-101 compliant), was the subject of a feasibility study completed by the Russians during the 1980’s. Western Prospector has commenced an aggressive exploration program, budgeted at Cdn$ 7.2 million. The Athabasca Basin of northwestern Saskatchewan, Canada, is the largest and richest uranium-producing region in the world and accounts for more than 33% of annual world production. Cameco operates and owns controlling interest in the uranium mines and mills at McArthur River, Key Lake and Rabbit Lake, all located in the Athabasca Basin. With the spot market for U3O8 having grown by about 40% in value in 2004 alone, and the high gross value of US$ 11,000 per tonne, based on a spot price if US$ 20.00 per pound U3O8, the Athabasca Basin has attracted a strongly increasing number of uranium explorers as is demonstrated by our overview.